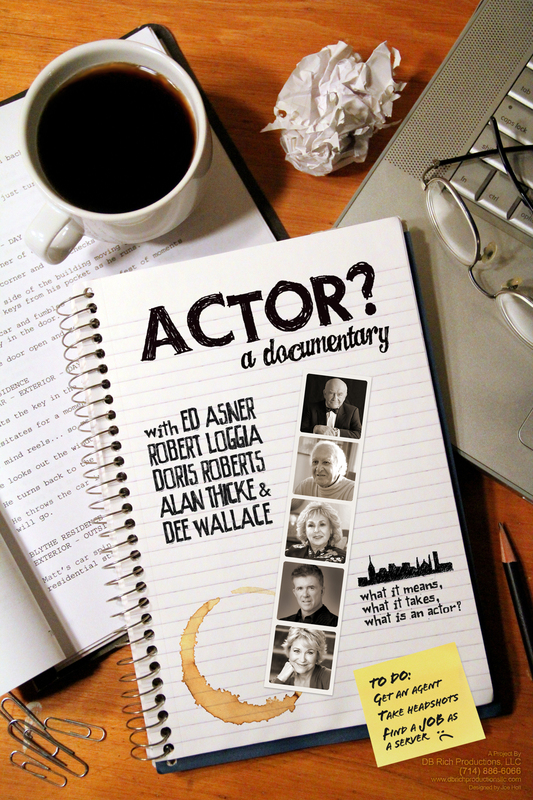 This a documentary that will give you insight to what it means to be an actor, why they do it and how to do it better. It will be the first documentary that uses animated characters and scenarios to narrate the interviews with real actors from across America. DB Rich Productions plans to release the animated documentary, "Actor, The Documentary", in October 2012. At any given time, only a fraction of professional actors are actually working. For every Leonardo DiCaprio raking in a multi-million dollar salary, thousands of actors slog through auditions, callbacks and rejections while making an average hourly wage of $16.59, according to the Screen Actors Guild’s statistics. And those are the lucky actors who actually get the parts. What does it take to make a professional life in such a tough industry? What are the trade secrets of getting in and staying around? The creative team behind “Actor? : The Documentary” explore the actor’s life, the craft and the career from the mouths of successful performing artists, casting agents and hundreds of aspiring actors from across the country. Filmmaker David Rich wanted to approach the question from a new and innovative perspective—the animated documentary. Most audiences are familiar with movie stars and their experiences on talk shows or press tours. In reality, those above-the-title stars only represent about 1 percent of the professional acting world. For those not blessed with the confluence of luck, innate charisma and the genetic jackpot of good looks, “Actor? : The Documentary” provides insight, experience and advice from some familiar character actors, along with hundreds of professionals from around the country. David Rich and Helen McCready are both producers in this project,. In addition Helen McCready is the Casting Director who was instrumental in obtaining much of the named talent in this movie. Ed Asner will always be known as Lou Grant, the beloved news director from “The Mary Tyler Moore Show.” But Asner has never stopped working since he started with TV guest spots in the late 1950s and in 2009 played the lead curmudgeon in the Oscar-winning “Up.” Along the way, he also served as President of the Screen Actors Guild from 1981-1985. Doris Roberts has won five Emmys, four of which were for her iconic and infuriating Marie Barone on “Everybody Loves Raymond.” Her career spans over fifty years, beginning with the Broadway stage. She guest starred on dozens of TV shows before landing supporting regular roles on shows like “Angie” and memorably as Pierce Brosnan’s secretary on “Remington Steele.” After nine years on the “Raymond” set, Robert continues to guest star and take on film roles. The film also includes conversations with Alan Thicke(“Growing Pains”), Dee Wallace(“E.T. : The Extra-Terrestrial”) and Terry Moore(“Mighty Joe Young”). DB Rich Productions LLC, a film production company, expects to release “Actor? The Documentary” in the Fall of 2012. The company was founded in 2009 and is dedicated to bringing original and entertaining movies to the public. Other DB Rich films include "Through Maria's Eyes," a World War 2 period drama taking place in Hungary. “Margarine Wars" takes a comical look at Wisconsin’s strange but true butter laws with a script co-written by Scott Walker and Joe Holt. Filmmaker D. B. Rich is a native of Rockland County, New York and worked in midtown Manhattan. Having worked as an actor and stand-up comedian before founding his film production company, Rich understands the world of entertainment from both sides of the camera. Helen McCready, a Canadian born citizen now residing in Los Angeles, also works as a CSA casting director and president of the National Actors Day which the inaugural date is set for Sept 8th. What it means to be an, What it takes to be and actor and What is an actorThe first animated documentary with interviews of real actors by the animated characters.